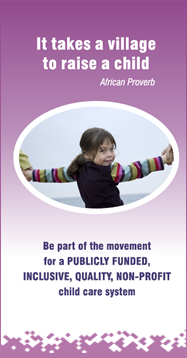 Nov 19 2007, Economic and social development organizations join the Coalition and the Advisory Council on the Status of Women asking the Graham government to invest in the creation of quality spaces within the New Brunswick child care system. Here is a link to the common statement read at the press conference. November 19 at 10 a.m.; On the eve of National Child Day, the Child Care Coalition and the Advisory Council on the Status of Women will be partnering with Economic Development Organizations to ask the provincial government to invest in the creation of additional quality child care spaces in New Brunswick. October 17 2007, Child care advocates respond to the federal Speech from the Throne.